I have tried so many veggie burger recipes over the years only to have almost every single one turn out the same way……….too mushy. Frustrated and dissatisfied with every bite, I set out to make the perfect veggie burger that would create that non-negotiable crispy outer layer while still staying extra juicy on the inside. Of course it also had to combine a multitude of superfood veggies and aromatic spices to make it the best veggie burger. Secret #1: Beets! Yes, beets. Those circular pinkish things that your grandmother used to make you eat from a can. Truth is, beets are chock-full of nutrients and are getting easier and easier to incorporate into our diets. 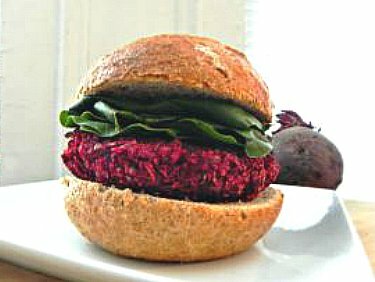 Beets also have a high water content so finely shredding them in these burgers keeps them extra juicy. Secret #2: Rest! Letting the mixture set in the fridge and then forming them into thin patties prior to grilling creates that yummy and crispy outer layer and those coveted grill marks. The result: a crispy, juicy, nutrient-packed burger that your body will thank you for. I love to make this when I have a burger craving but don’t want to have meat. It’s mostly carbohydrates due to the quinoa and beets so top it with avocado or 1 oz of cheese to add some fat and serve it alongside some extra protein (i.e. 1/2 scoop protein shake) to make it balanced and keep your blood sugar stable. Meanwhile, chop beets in a food processor or mini chopper (you can also do this by hand with a grater). Next, add diced onion, mushrooms and garlic to a large skillet lightly coated with cooking spray over med-high heat. Cook until mushrooms are tender and onions are translucent, about 3-5 minutes. Remove from heat and let cool slightly. Transfer to a large bowl, add beans, and roughly mash beans and mushroom mixture together. You want to keep some texture of the beans so you don’t need to mash them completely. Next add beets, cooked quinoa, oat bran, and spices and mix together until combined. Place mixture in refrigerator for 10-15 minutes to set. Remove from refrigerator and form into patties (thinner patties will give them a crispier edge). Coat a grill pan with cooking spray and place over med-high heat. When pan is hot, cook the burgers until brown on top and grill marks form, about 5-8 minutes per side. Serve on your favorite whole grain bun with the toppings of your choice. Or for an even healthier burger, eat wrapped up in collard greens! Serve alongside some Cinnamon Spiced Sweet Potato Carrot Fries for the perfect meal without the guilt.